Just because we're no longer 9 till 5 on the High Street, doesn't mean you can't still see us! We’re delighted to now offer Visits by Appointment at our Belper Office. 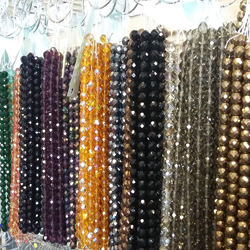 Come and browse and purchase our extensive ranges of Miyuki Seed Beads, Czech Multi-Hole Beads, Czech Glass, Beading Kits and Crystals over a cup of tea or coffee, in a relaxed and unhurried atmosphere. Visits are strictly by appointment only as we’re not always at work, and sometimes outside commitments mean that we’re only around to dispatch internet orders before rushing out again, so if you have a selection of dates when you’d like to visit that would be great! To arrange a weekday visit to us, please complete the form below, with an indication of when you’d like to visit (advance notice please!) and a member of our team will contact you as soon as possible to confirm date and time. If there are any particular products or colours, or a specific quantity of beads that you are after, then please do let us know on the form below, so we can check stock levels for you and save you a wasted trip if we don’t have what you’re after currently in stock. We don’t have a minimum spend, but please note that we are unable to accept card payments under £5, and we always appreciate exact coinage! Our new Reward Points Scheme is also valid for purchases made in person, and Points will be linked to your online account for your convenience. We’re on the 4th Floor of North Mill, and we are accessible by stairs and lift. There is ample free car parking available at the North Mill, and we are just a 2 minute walk from the picturesque River Gardens. Entry to the building is via the Intercom, with entrance through the doors on Bridge Foot (just before the ChuckleButties Play Centre).